Hola todos! This week was jam packed. Unfortunately, we didn't have as much time this week to be working in our area. But we still saw some miracles happen! Despite the busyness with all he meetings we've had, Elder Barrett and I have seen the Lord guide us in our efforts this week. One highlight and some good news is... we set a date for our investigator Alana to be baptized on March 10th! First off, on Friday while we were planning our day, we both felt like we needed to see her that day. Turns out when we went over there, she told us her friend wanted to take her out partying that night. Our lesson was so timely. We were able to help her remember the blessings of choosing the right. We shared with her Mosiah 2:41, and talked about the happiness that comes from keeping the commandments. It was really a sweet moment, when she made the realization, "Wow, so that's why since I've been coming to church things have been getting better and I've been happier!" The sweet spirit was so strong. She also told us she received an answer to her prayer to break up with her boyfriend who hasn't been a good influence on her. She's been taking some great steps in the right direction, and we are super excited to see her progress even more! Another spiritual highlight of the week was a really powerful training that was given during MLC. They talked about our desire to find new people to teach. 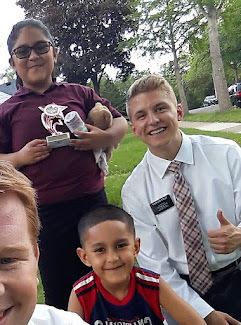 A quote that resonated with me was, "Our desire to share the gospel directly corresponds with the depth of our witness of Christ and his atonement." Being a missionary can be hard. Sharing the gospel with others can be hard. Being obedient can be hard. Whatever the case may be, if we strive to strengthen our conversion to the Savior and His gospel, our righteous desires will increase! I love you all! Thank you again for all your love and support. Dios les bendiga.